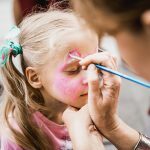 Creatio’ Face Painting Activity During Summer Retreat Carnival Event in New York. Creatio chapter members joined the Carnival event during the Summer Retreat of New York Immanuel Church. Members volunteered to give face painting to children drawing gospel images or animals on their face and body.